Avery Bradley is considered one of the best defenders in this group, and his situational strengths characterize him as a potential high-level role-player. One of the lower usage players in this group at just 12.6 possessions per-game, Bradley scored on a slightly below average 40.8% of his touches. With 24% of his possessions coming in transition, the freshman shot 53.3% on the fast break, and scored on a below average 38.2% of his half court possessions. While hes certainly not the most dynamic offensive threat at this point, Bradley was very solid in spot up situations. With a sizeable 30.5% of his touches coming from such opportunities, he shot a second ranked adjusted field goal percentage of 60.9%. The least prolific player running the pick and roll (.57 PPP) and a mediocre isolation player, Bradley was heavily reliant on his jump shot to score points. Nearly 75.7% of his half court shots were jumpers, and he led all players with a 43.1% shooting percentage on such attempts. Despite being a prolific shooter, Bradley is the worst finisher in this group, averaging 0.754 points per-shot. One of the top unguarded and guarded catch and shoot players in this group (1.347 PPP and 1.149 PPP), he proved capable from the perimeter during his time at Texas, but struggled at the rim. His frail frame certainly wont help in that area on the next level either, but his ability to defend and ability to hit shots from the perimeter tailor him to a smaller role than he played last season. Everything about Bradleys profile from the numbers we have at our disposal indicates that hes best suited playing off the ball at the moment. Considering he was only a freshman, he could obviously still develop his playmaking and shot-creating ability in the future. At 6-2 without shoes, with a 6-7 ¼ wingspan, Avery Bradley might just be able to get by at the shooting guard position, which appears to be a more natural fit for him. Numerous NBA executives pointed out how impressed they were with him this weekend. His stock appears to be rising considerably at the moment. Adding strength to his 180-pound frame looks like a big priority for the freshman at the moment. Avery Bradley has had an inconsistent freshman season, not unlike many of his teammates and the Texas Longhorns as a whole. Bradleys shots and production fluctuated wildly from game to game, and he didnt do much to improve on his weaknesses over the course of the season, though the one thing that remained consistent throughout was his intense, smothering defense. We covered Bradley extensively less than two months ago here, but with many indications suggesting hell be entering his name in the draft, its worth taking a more detailed look at this unconventional player whose stock is likely to be all over scouts boards. Bradley is a somewhat unique prospect in that there really isnt anyone in the NBA with his skill set, and there are questions about how easily hell be able to find a niche. The majority of undersized pure 2s in the NBA are versatile scorers that can consistently create their own shot, while Bradley on the other hand is a more selective shooter who isnt adept at getting to the rim, though is also an outstanding defender. Bradleys lack of anything resembling playmaking skills or a point guard mentality may be his most concerning attribute projecting to the pros, as itll be very tough to play him at the 1-spot without great shot-creators around him. While Bradley is capable of making flow-of-the-offense passes to open shooters at times, when he puts the ball on the floor he goes into clear scorer mode, looking exclusively for his own shot, even out of pick-and-roll scenarios. Developing into a more versatile pick-and-roll threat could vastly open up his own offense, while also giving teams another reason to give him playing time. This might be the most important thing to follow as the freshmans career progresses. Bradleys strongest offensive attribute is undoubtedly his jump shot, which he is very reliable with in catch-and-shoot situations and pulling up off one or two quick, compact dribbles. While lacking much in the line of advanced moves, Bradley still does an excellent job getting separation for his jumper by using shot fakes, jab steps, and rip moves in combination with good footwork and a good first step. The interesting thing about Bradleys shot is that in spite of having very good form, boasting great elevation and a high and quick release, hes still prone to many shots that completely miss the mark, and hes shooting a surprisingly poor 55% from the free-throw line (albeit on a limited 66 attempts). Speaking of free throws, another major problem area in Bradleys game is his inability to get to the line, something that most combo guards in todays NBA are expected to do. He ranks dead last in free throws attempted per-40 minutes pace adjusted amongst all players in our 2010 or 2011 mock drafts in fact, drawing just 66 attempts in 1000 minutes this season, or one for every 15 minutes hes on the floor. Another issues revolves around his inability to get high efficiency possessions around the basket in general. Hes scoring an incredibly poor 0.75 points per shot on shots around the basket according to Synergy, and in watching his game, its easy to see why. Bradley is often out of control on his drives to the basket and very rarely puts in much effort to create high percentage looks, rather trying to get close to the rim and then just throwing the ball in the general direction of it. On the bright side, Bradley does show an effective floater when hes intently looking for it, and many of his problems attacking the basket are related to a careless mentality as opposed to lack of ability, though he will certainly have some limitations projecting to the pros given his lack of size and strength. Defensively is where Bradley projects best to the pro level, but the problem here is he will need to find a proper niche to best put his strengths to use, as his physical makeup is much better suited to defending point guards and combo-guards than it is taller shooting guards. Bigger players will be able to simply shoot over him and overpower him on drives to the basket, things that happened when faced with those situations this yearfor example against James Anderson. To Bradleys credit, one thing he does incredibly well is play outstanding prevent defense off the ball, sticking to his man like glue all over the floor and blocking off passing lanes to keep the ball away. On the ball, his lateral quickness is superb, as is his fundamental stance, and he puts in excellent effort all the time, getting right up into his man no matter where he is on the floor, using his length and hands very well, and always getting a hand up to contest a shot. For all of Bradleys strengths on defense, however, he has struggled defending the pick-and-roll this season, due in part to his physical nature, as hes prone to run full force into a well-set pick, getting stuck and not being able to recover, as he doesnt have the strength to fight through them. Looking forward, Bradley is an extremely interesting prospect, but where and who he gets drafted by will have a huge impact on his immediate success in the league. Playing alongside a big shot creator (such as Tyreke Evans or Dwayne Wade) who can defend 2s, or coming off the bench to play off the ball and defend opposing point guards or combo guards are situations he could find himself excelling in. He should also benefit from playing alongside more steady playmakers in the pros than the revolving door of shaky point guard play he saw at Texas. Continuing to work on his three-point range, being more focused on his shot attempts in the lane, and really working to develop his pick-and-roll game should be among his priorities, and all of those things could help him find more potential niches in the pros, something that could be challenging if he is drafted into a tough situation. 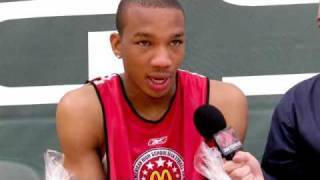 After a weekend in which he dominated some of the top teams in the country, Avery Bradley (#10 Scout, #8 Rivals, #1 ESPN) has recently risen to the number one spot on ESPN's rankings of the class of 2009. Having already been scouted extensively by DraftExpress at several other events this year, this write up will be short. The future Texas Longhorn had all of his weapons on display this past weekend in Maryland. He scored a tournament high 27 points in his second game of the tournament, doing the bulk of his damage with his stellar mid-range game. Bradley is extremely difficult to cover due to his excellent quickness, but also because of his ability to stop on a dime and elevate with a smooth shooting stroke. The McDonald's All-American dunk champion was able to get out in transition and wow the crowd a couple of times during the course of his three games with several impressive throw-downs. Where Bradley really impressed was with his defense. Based on what we saw this weekend, it is a safe bet that the two-guard will be a force from day one in the Big 12. His lateral quickness was absolutely unparalleled and his quick hands allowed him to come away with nearly a dozen swipes over the course of the tournament. He also used his outstanding leaping ability to pin a handful of shots off the glass, on the rare occasion when he was beaten off the dribble. The Findlay Prep star is going to be an instant impact player at the collegiate level. It may be too soon to determine how he'll project in the NBA, but if his development so far is any indication, we'll be seeing Bradley at the pro level sometime in the not too distant future. Bradley was definitely one of the weeks standouts, both in the practices and in the five on five games we were able to take in. There isnt a whole of new information to add to our very comprehensive file on him, so see our report posted on Tuesday for our latest thoughts. At the very least, he looks like hes going to make a strong run for Big 12 freshman of the year honors. Avery Bradley really came to play today, doing an outstanding job showing his skill-set on both ends of the floor. His outstanding athleticism was constantly on display with the way he crashed the offensive glass, coming up with a number of excellent put-backs, and also hammering home some impressive dunks in transitionnot a surprise considering that he won the dunk contest last night. While not yet a great 3-point shooter, and likely an improvable ball-handler, Bradley showed a terrific first-step and a prolific mid-range game, which should allow him to make an impact offensively for Texas right away. Defensively, he was outstanding as he always is, showing a real competitive spirit that was sorely lacking at these practices the past two days. Even though hes clearly not a point guard, and his current limitations are fairly evident, Bradley has the makings of an intriguing long-term prospect that well definitely have to keep an eye on right away in the Big 12. Avery Bradley (#8 Rivals, #10 Scout, #7 ESPN) was chronicled in depth in November with his play at the National Prep Showcase, and proved to easily be the best all around player that the event had to offer. His stellar play on both ends of the floor was unmatched by his counterparts, and proved crucial as to why Findlay narrowly escaped with a 3-0 record. Simply able to do whatever he wanted on the offensive end, it was a dominant offensive performance for Bradley. He got to the rim, finished in the paint, and knocked down gorgeous mid-range jumpers. Most impressive about the Washington natives play on the offensive end was the court vision he showed. Making gorgeous passes and continuously finding the open man against the zone defenses that his team faced, the potential for Bradley as a combo guard is becoming more and more apparent each time we see him. The main area of concern with Bradley from this past weekend was his inability to shoot the ball from beyond the three point arc. Unable to connect on a single three point shot over a three game stretch, this is something that he must continue to improve on if he truly hopes to keep defenders honest next season in the Big 12. Avery shot the ball much better when we saw him in Rhode Island, but was unable to make any of the 11 three pointers he attempted this weekend. Bradleys defense was stellar as usual, given that he was able to put the clamps on whoever he guarded. The quickness that he possesses laterally is unparalleled by any of the elite prospects that he have focused on, and it just doesnt stop there. Not just relying on his natural gifts, Bradley actually understands HOW to defend without gambling. The stat sheet reflects that, as he collected 14 steals on the weekend with not even half as many fouls. Truly one of the elite players in the country, Avery Bradley should come in and make a considerable impact at Texas. Its a bit premature to speak about his draft prospects before he even begins his freshman campaign, but Bradley is certainly a player who NBA scouts will be following very closely from the second he steps foot on campus in Austin. Avery Bradley (#10 Scout, #8 Rivals, #15 ESPN) was hands down the top performer here at the National Prep Showcase, willing his team to a 2-0 record while putting up gaudy numbers in the meantime. While he might not the best long term prospect in the class, a case could be made that Bradley is the top pure basketball player at the moment in the class of 2009. Physically there is little not to like about Bradley. Although undersized for a shooting guard prospect at around 63, he possesses nice length and very good athleticism. Listed at 185 pounds, he has a frame that will surely fill out in time. Add in an excellent combination of leaping ability, lateral quickness, and first step, and you see why you have the makings of a terrific prospect physically. The Washington native is an absolute nightmare to guard offensively. The bread and butter of his game centers around his pull-up mid-range jumper, which he can create and get off at will. Capable of stopping on the drop of a dime, he gets outstanding elevation with a high release point on his pull-up. When combined with his great first step, he is able to get defenders back on their feet with his strong initial drive, and then rise up before they are able to even contest his jumper. Far from a one dimensional player, Bradley is also capable of attacking the rim and finishing in traffic. He is an explosive leaper from a static position, allowing him to rise up amongst the trees without having to run to gain momentum. This enables him to score against much bigger foes and make an impact on the offensive glass, despite his lack of height. Bradleys scoring instincts allow him to slither his way through defenders when slashing to the rim, rarely getting out of control in the least bit. Though clearly strictly a shooting guard, he displays very solid ball handling skills, keeping the ball low and tight when creating his own shot. Bradley has no shortage of scoring moves, whether it be nifty spins, inside-out dribble moves, or multiple crossovers. One area of Bradleys game that he has shown considerable improvement in is his ability to shoot the ball from beyond the arc. Though he only attempted a single three point shot in his first game at the National Prep Showcase, the Texas signee appeared very confident in his shot during his second outing, drilling three 3-pointers in Findlays win over St. Marks. From beyond the arc, his shot showed the same solid fundamentals that his pull-up did, and if he continues to expand his range, it will make him a nearly complete player on the offensive end. Although he plays the shooting guard position exclusively, Bradley displays very nice court vision when distributing the basketball. His high basketball IQ, terrific unselfishness and good court awareness are evident when hes on the floor, as seen by the limited amount of turnovers throughout the tournament. Though not one to initiate the offense, there definitely appears to be potential for Bradley as a combo guard down the road. Widely regarded as the best on-ball defender in the country, Bradley did very little to disprove that notion. With his outstanding lateral quickness and long arms, he applies immense ball pressure on opposing defenders, without reaching or putting himself in vulnerable situations. Likewise, he is a force in the passing lanes with the number of steals that he obtains without over-pursuit of the ball. Though not a very vocal leader, the effort that he applies on this end of the hardwood appear to rub off on his teammates. Bradleys size and strength allow him to get in there and rebound amongst the trees, making him quite the complete defender at this stage of the game. Pairing with friend and fellow top-10 recruit Jordan Hamilton, Texas will have one of the strongest perimeter attacks in the country for 09-10. Given Bradleys lack of size, its hard to call him a one and done prospect at this point. However, if he is able to maintain the same impact at the collegiate ranks that he has had the prep level, it is certainly not out of the question.